The Daintree Rainforest Environmental Centre (now known as the Daintree Discovery Centre) was built in 1988-9 and opened by Senator Graham Richardson on June 26, 1989. From humble beginnings the Centre has become a very successful, privately funded enterprise that is setting a benchmark for other ecotourism operators. Despite being visited by thousands of people every year, it is recognised as a highly sustainable tourism attraction. 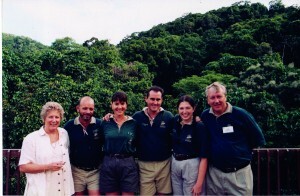 The original concept for an environmental centre in the Daintree Rainforest area came about following a visit to the region by the founders Ron and Pam Birkett. As a result of this initial visit,they came to realise the majority of visitors were leaving the area feeling as they did – disappointed and somewhat disillusioned with the lack of information about the rainforest available for visitors. Damaging the rainforest: There was absolutely no provision for local, interstate or overseas visitors to actually experience the rainforest first hand, explore the fauna and flora, or begin to understand the historical, biological and social context of this unique wilderness. Unfortunately those who were venturing into the forest via commercially motivated, man-made walking trails were creating untold damage to such ancient areas as Noah Creek, desecrating the fragile under-story and disturbing the wildlife. 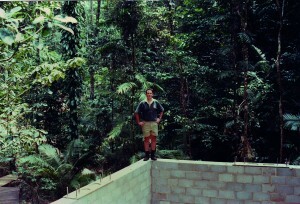 A personal commitment to eco-tourism: Following this initial foray into the rainforest the Birkett’s subsequently contacted the government pointing out the urgent need for interpretive information – and more particularly for an environmental centre that would allow controlled access to the rainforest, while at the same time protecting the fragility of the environment. The government was fully supportive of the concept but was not prepared to commit funds to the project at that time. Undaunted, the Birkett’s decided to go ahead and develop the Centre anyway. The consultation process: After extensive consultation with the National Parks and Wildlife Service, the local Council, the CSIRO, and various educational and rainforest research centres, including local and overseas museums, the Birketts purchased two relatively untouched, freehold parcels of low-land rainforest bordering the National Park. In 1988-9 the development of an educational interpretive centre in the Daintree Rainforest was no mean feat. There was no power, no telephone and limited local labour. However, after extensive consultation regarding the structure and design of the Centre a contract was finally granted to a local builder. Selecting the location: Great care was taken with the selection of the property. While we wanted people to be able to find us, we wanted to be situated well away from the main road. After much consideration we finally decided to locate the Centre in an unspoiled pocket of rainforest situated on the lower slopes of the Alexandra Range, just outside the area designated for World Heritage. While the property has 180 metres of main road frontage along the Cape Tribulation Road, a deliberate decision was made to locate the major buildings (the Interpretive Display Centre itself and the staff residence) approximately 500 metres down Tulip Oak Road, well away from the main road. New Chapter: After almost 30 years under the ownership of founders Ron and Pam Birkett, the Daintree Discovery Centre was sold in August, 2016 to the Aboriginal Development Benefits Trust (ADBT). ADBT, which is based in the Lower Gulf of Queensland, was established under the Gulf Communities Agreement negotiated between Century Mine, the Queensland State Government and Gulf Native Title groups. Its role is to administer funds from the Century Mine, primarily for business development and Indigenous ownership/investment in business, while also helping to build economic empowerment for local Indigenous Australians and their communities. The purchase of the Discovery Centre offers huge potential for ADBT to further develop its community, youth and entrepreneurship programs within the Lower Gulf. The 9th December 2013 marked 25 years since the Daintree Rainforest became World Heritage listed. On the very same day, work began on the building of the Daintree Discovery Centre. Click here to find out more about 25 Years of Wet Tropics World Heritage.